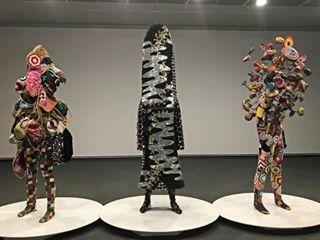 "Soundsuits" are among the art works of multi-disciplinary artist Nick Cave that are presented in a new Springfield Art Museum exhibit. Sarah Buhr and Joshua Best from the Springfield Art Museum. Nick Cave is one of today's preeminent multi-disciplinary artists, working in a wide range of media including sculpture, installation, video, sound and performance. The Springfield Art Museum opens an exhibit of Cave's works tonight during the First Friday Art Walk with a reception from 5:30 to 7:00pm. Museum Curator of Art Sarah Buhr, and Springfield Art Museum Development and Marketing Coordinator Joshua Best, appeared on KSMU's "Arts News" this morning to tell us about the exhibit. "This exhibition is focused on his 'Soundsuits,' which are probably what he is most famous for. The 'Soundsuits' are so named because they can literally can be worn, and they do make noise when you wear them," says Sarah Buhr--"although no one is wearing them during our exhibition. "The suits are made of all kinds of found materials. The first one was made from sticks." Shortly after the Rodney King beatings in Los Angeles in 1991, Nick Cave was in Millenium Park in Chicago. Being African-American himself, says Buhr, Cave "was feeling very vulnerable--and worried; he's a black man living in America. And he started gathering sticks in Millenium Park, and sewed them together to make a sort of protective 'suit'. He refers to them as a 'suit of armor.' That launched into a much larger body of work. I think there are something like 500 suits. But the ones in the show that you'll see here, some are made of buttons; some are made with vintage toys. We've got sock monkeys and sequins and beads and bags, and all kinds of materials that he's found and put together into these really fantastic sculptures." She adds, "He's multi-discipinary, so he has videos, he's done a lot of performance art." Another part of this Springfield Art Museum exhibit is a video Cave calls "Drive-By." It features "the Soundsuits in action. People are dancing across the screen in the Soundsuits." Visitors to the exhibit will also see an example of one of Nick Cave's "Tondo" round wall works. "This particular piece is from his latest series called 'Weather or Not.' And the imagery is very abstract, very colorful. But the colors are pulled from brain scans of young black youth who have suffered from Post-Traumatic Stress Disorder from gun violence, overlaid with weather maps from climactic weather events. So they're swirling and colorful but have deeper layers." The Nick Cave exhibit continues through July 28 at the Art Museum, and there are a couple of special events connected to this show: a Family Art Day Saturday April 13 from 10:00am to noon, and on Thursday May 2nd at 7:00pm, an evening of "Responsive Dance Performances", featuring dancers from Springfield Ballet, Springfield Dance Alliance, and the Missouri State University Theatre and Dance Department. Art Museum Curator Sarah Buhr says "they'll perform responsive dances that they've created, inspired by (Nick Cave's) Soundsuits." And while we had Art Museum Development and Marketing Coordinator Joshua Best in the studio, it seemed appropriate to bring up another museum event taking place April 25-28: the second annual "Art in Bloom." "Last year we had over 1600 patrons come through the Museum during Art in Bloom--the largest Museum event on record. It's a mix of paid events that benefit our Art Acquisition Fund, with a mix of public events that are free and open." The four-day festival celebrates fine art through fantastic floral displays inspired by the artwork on view in the Musuem's galleries, and created by florists and floral designers from throughout Southwest Missouri. To find out more about these and other Springfield Art Museum exhibits and activities, call 837-5700 or visit www.sgfmuseum.org.